This week has been the best one so far, and I hope that I’m eventually going to sound like a broken record in these updates, saying, “I’m feeling better!” every week. Evenings and nights are still the hardest time of day for me, but the days have been so fantastic that I don’t even mind. It’s so wonderful to feel like myself again, to have the energy to work on projects, to enjoy all the things I used to enjoy before I started feeling sick. I have actually been cooking dinners, and that feels like a huge accomplishment, even if sometimes Eric has to take over halfway through because I start feeling sick. I have a feeling we’re going to have a romantic Valentine’s lunch instead of dinner, but that’s okay with us. I am thrilled to be eating a more well-rounded diet now, but I wouldn’t say I have had any real cravings, except maybe for the unexpected things you really can’t have during pregnancy. I told Eric I am planning on having a huge pastrami sandwich after the baby comes, and I happily imbibe the fragrant steam from everyone else’s coffee. I sorely miss feta and goat cheese too. Maybe I will slather them on that pastrami sandwich. I am still getting up to eat in the middle of the night and eating frequently to stave off the nausea that comes with an empty stomach. I’ve left bread and crackers behind, and now my mainstays are plain yogurt and cottage cheese (protein helps keep me full longer). So if you catch someone scooping yogurt out of a pint container at 3am…it’s me! We had an OB appointment this weekend, and while I was initially disappointed that we didn’t get an ultrasound, the sound of our baby’s heartbeat thumping away was enough to bring tears to my eyes. I have been really nervous before our last few appointments, not because I think something is wrong with the baby, but just because I am so excited to see him/her. I am just madly in love with this tiny person already, and he/she is going to carry my heart for the rest of my life. It reminds me of how nervous I used to feel before my early dates with Eric: happy flutters, extreme joy. We had a marvelous weekend, kicked off with lunch at the cutest cafe after our OB appointment. It feels amazing to be on a date with Eric, and I’m treasuring these last special days of just the two of us. 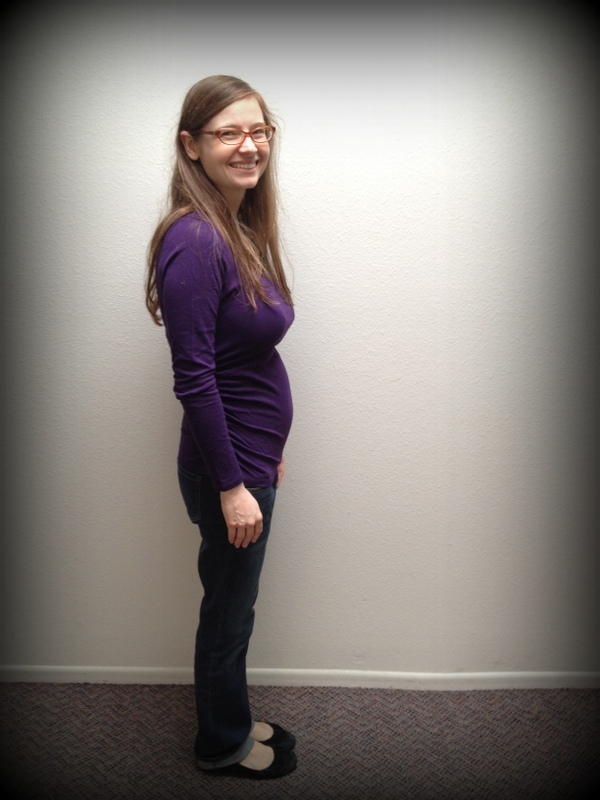 We also went shopping for maternity clothes (woot! ), during which Eric was as patient as a saint (no surprise there), and I got pretty much everything on clearance. On Sunday we had lunch with dear friends, and that was lovely too. Every normal thing I can do, I feel so grateful for it. In weird pregnancy symptoms, at least the ones that are fit for sharing, I have a really stuffy nose most mornings and nights. It turns out that that’s actually a thing, and it’s called rhinitis of pregnancy. Who knew! Apparently it’s caused by extra blood circulating in the area (the same thing that causes your gums to bleed during pregnancy). Last night I had a real scare when I felt a sharp pain in my abdomen, down where the baby is. It kept pulsing for a few minutes, and I was momentarily terrified. Then I thought of something I had read before and asked Eric to look up round ligament pain in one of our books. Thank goodness the description matched exactly, and it’s totally normal for this stage of pregnancy. If you google round ligament pain and see an image, it’s easy to see why this poor little strip of tissue is hurting–it stretches so much to support the weight of the uterus! Anyway, I sort of feel like this is something they should preemptively tell you as soon as you get a positive test: Hey, you are going to feel these crazy pains in a few months–don’t worry! In spite of all these weirdnesses, I am in awe of what my body is doing. Every time we see the baby or hear the heartbeat, I seriously just can’t believe it. You look so cute holding your baby, Little Mommy! you are just the sweetest, I love reading your posts and share in your happiness!! What a darling little post! What a pleasure it is to see you, and you and Eric, enjoying pregnant life! 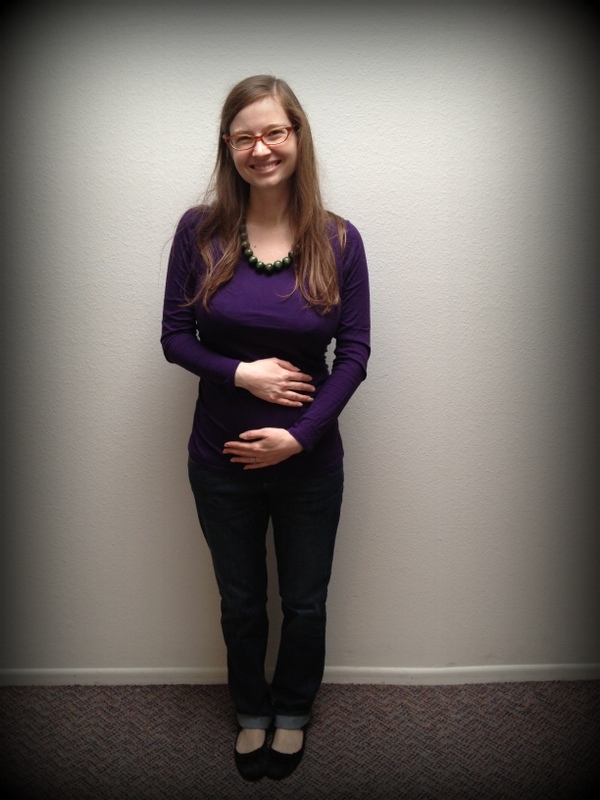 Before you know it those little maternity pants will fill right out! Aaaaaaand now I’m crying. Probably not for the last time, either. You are going to be the absolute best little mommy. Aw, you are so sweet! Thank you! Also, would you like to send my World’s Latest Comment Answerer Medal in the mail? I’m so glad you’re finally feeling better; it seems like an incremental process! But it seems like you’re slowly but steadily getting your energy back!